In 1181, King Jayavarman VII launched a military campaign against the Chams, as vengeance for the Cham raids of Angkor in 1177, and to finally defeat one of their traditional enemies. Leading a powerful army, Jayavarman VII repelled the Chams from Angkor, and attacked Champa, further east, to finally defeat them. The conquest of Champa gave Jayavarman VII the highest position of God-King, and sparked his rule as one of the greatest achieving Khmer kings. Khmer elephants are depicted with a driver, armed with spear and shield, and a single archer or sometimes spearman. Those ridden by generals (identified by being shown enlarged) are accompanied by one or more parasol carriers on foot. Neither these nor elephants being shown in the background of infantry combats. Chariots, with only one fighting crewman, are shown only in scenes believed to depict Indian mythology, although of a distinctively Khmer type. A Chinese ambassador notes guards on horseback and in chariots in 1295. The ph’kak is an axe-like weapon resembling a hockey stick with an axe blade at right angles to its end. Maiden guard are depicted in one relief armed with ph’kak and mounted on horses apparently disguised as dragons. Doubt has been expressed whether these are over-interpretations of a damaged relief, but such equipment is only an exaggeration of the normal cavalry tack, which includes a possibly leather rump guard over a tail plaited to a point, a “dragon horn” (of stiffened horse hair?) on the forehead and sometimes face and chest protection. Spearmen carry either a long or small round shield. Khmer archers/skirmishers shown behind a wall of pavises, but most appear to be skirmishers. The artillery. was Chinese-type “double crossbows” man-handled on wheels or mounted (or possibly only transported) on elephants. It was probably acquired from the Cham, who learned its use with that of crossbow cavalry from the Sung Chinese. Thai allies have been identified at Angkor. Their only difference from the Khmer except in dress is the long machete-like sword carried by the infantry. 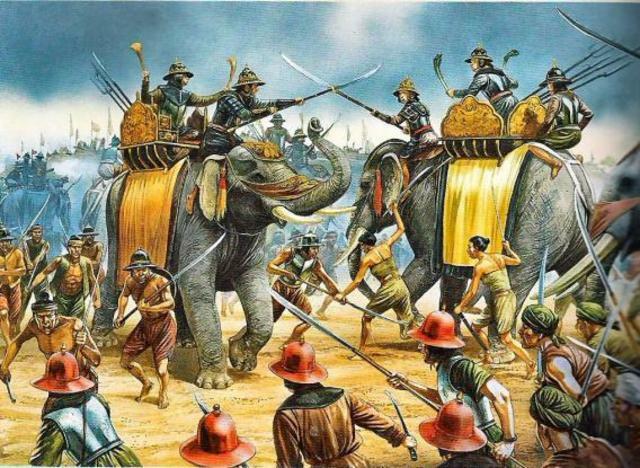 The Thais were as yet rather barbarous. Between 800 and 1400 CE the Khmer empire dominated much of mainland Southeast Asia. At its height it controlled all of present-day Cambodia as well as large parts of southern Laos, eastern Thailand, and southern Vietnam. The Khmer empire was founded in 802 by Jayavarman II, who moved his capital from the lower Mekong to the area between the Kulen Hills and the Tonlé Sap. He marked the occasion with an elaborate Hindu ceremony aimed at fusing the temporal power of the king with that of Hindu and local deities and enabling the ruler to build a coherent state from the fragmented polities that at the time marked the Cambodian landscape. At the center of this empire was the sprawling Khmer city of Angkor, which may have had a peak population of 1 million. Angkor was remarkable for its many stone monuments built with immense labor and intended to glorify Siva, Vishnu, and the Khmer kings. As such monuments reflect, the Khmer were originally devotees of various Hindu cults, having received religious and cultural influences from South India centuries earlier before adopting forms of Mahayana and finally Theravada Buddhism. Regardless of the devotional changes, Khmer kings stood at the apex of a sophisticated society supported largely through rice production. Its economic centrality notwithstanding, there is a considerable amount of controversy regarding one aspect of Khmer rice production. Some scholars have argued that the huge reservoirs located at Angkor and other sites may have been used to irrigate rice paddies during the dry season, while others have identified the reservoirs as having a purely ceremonial function. Jayavarman VII, one of the last great Khmer rulers, came to power in 1181 during a period in which the Khmer were under increased pressure from the neighboring kingdom of Champa. This Buddhist monarch built the Bayon, the last major monument constructed at Angkor. Soon after his death the Khmer empire entered a period of sharp decline and was increasingly at the mercy of Vietnamese, Cham, and Thai armies. Angkor was sacked by the Thai in 1431. Reasons for the decline and fall of the Khmer empire are murky. Environmental change and mismanagement of soil and water resources may have led to bad harvests. The building projects intended to glorify the Khmer rulers, which required the services of untold laborers and artisans, may have taxed society to the breaking point. Finally, victorious foreign armies would have deported large numbers of Khmers, as was usual in Southeast Asia. Angkor was not totally abandoned. Small-scale building projects may have been undertaken as late as the mid-1500s, and the temples were long home to Buddhist monks. But Cambodia’s political center shifted south to Phnom Penh, where it remains to this day. In ensuing centuries, Cambodia became a minor player in mainland Southeast Asia and during the nineteenth century was in danger of being swallowed up by Thailand and Vietnam before it passed under French colonial control. The French discovered the ruins of Angkor in the jungle and spent the first half of the twentieth century restoring and studying its monuments; it became and remains one of the world’s great tourist sites. For modern Cambodians, the Khmer empire has continued to be a symbol of national achievement. Bibliography Coe, Michael. Angkor and the Khmer. London: Thames and Hudson, 2005. Higham, Charles. The Civilization of Angkor. New York: McArthur, 2003.